Just a few decades ago, the Koreans were an impoverished, agricultural people. In one generation they moved from the fields to Silicon Valley. The nature and values of the Korean people provide the background for a more detailed examination of the complex history of the country, in particular its division and its emergence as an economic superpower. Who are these people? And where does their future lie? In this absorbing and enlightening account, Michael Breen provides compelling insight into the history and character of this fascinating nation. 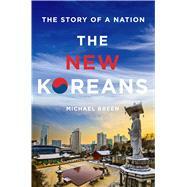 MICHAEL BREEN is a writer and consultant who first went to Korea as a correspondent in 1982. He covered North and South Korea for several newspapers, including the Guardian (UK), the Times (UK), and the Washington Times. He was the president of the Seoul Correspondents Club for three years during South Korea’s period of democratization and has traveled widely in North Korea. He is married with three children, and splits his time between Korea and the United Kingdom.